The Rolling Stones have reached a deal with organizers of the Glastonbury festival that will see an hour of the band’s June 29th performance broadcast on television. 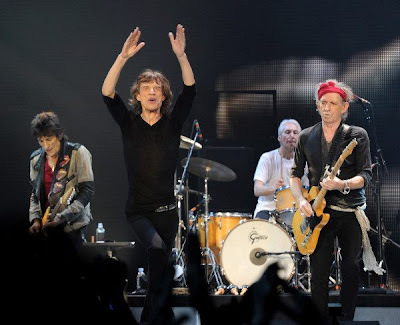 According to the BBC, the Stones had originally insisted that only four songs from their 90-minute set could be televised, but festival organizer Michael Eavis told reporters a compromise had been reached. Eavis, who established the event on his farm in Pilton 43 years ago, said he had also endured protracted negotiations with the group to secure their performance. "It's taken a long time to get them to come and play," he said. "Everyone wants to see the Stones, basically." "I think Mick Jagger wanted to play to the people here, rather than a TV show," he added. "They're going to be playing for about an hour for the TV." Last month, the BBC said there would be 250 hours of live broadcasting from Glastonbury's six main stages. The festival starts Friday June 28, with opening night headliners Arctic Monkeys; the Stones play Saturday and Mumford & Sons close out the event on Sunday. The Stones play two more shows on their current “50 & Counting” North American tour – Philadelphia on Friday and Washington on Monday.